As U.S. troops pull out, the brave men who helped them are targets of the Taliban. No one is sure how many interpreters have already been killed by the Taliban. As a combat videographer, U.S. Army Staff Sergeant Robert Ham believes more than most in the power of film. Now he hopes his yet-to-be-made short film The Interpreter will have the power to save thousands of our Afghan allies from grisly deaths at the hands of the Taliban. A Kickstarter campaign with a compelling promotional video is underway to fund the project. So far, $7,500 has been raised of the $20,000 needed by the end of August if the project is to move forward. If the funds are raised, Ham, the winner of three Department of Defense Military Videographer of the Year awards and two Emmys — merely “regional” Emmys, he emphasizes, but Emmys nonetheless — will direct the film. Although Farooq Haqmali, the protagonist of The Interpreter, is a fictional character, the plight of Afghan interpreters who risked their lives to help coalition forces defeat the Taliban is very real. So is Ham’s friendship with an Afghan interpreter — let’s call him Kemal — whom he worked with during his 2009–10 Afghanistan deployment. When his deployment ended, Ham continued communicating with Kemal through Facebook and e-mail. What he learned distressed him. Not only was Kemal constantly receiving threatening letters and phone messages, but his house was bombed. Although no one was harmed in that incident, another attack cost his father both of his legs. To Ham, leaving behind a loyal Afghan ally in such circumstances is nothing less than betrayal. Kemal began serving the U.S. military in 2003 and continued that relationship until the base he worked at was shut down in 2013. As U.S. military units rotated in and out of Afghanistan every year, Kemal remained in unrelenting danger for a decade. Surely, the U.S. government ought to do something to improve his situation. Many members of Congress share Ham’s sympathies. In 2009, Congress passed the Afghan Allies Protection Act on bipartisan lines; the act was renewed in 2014, also on bipartisan lines. Section 602(b) of the 2009 act created a Special Immigrant Visa, which would allow Afghans who had provided faithful service to the U.S.military, and who were receiving credible threats to their safety, to immigrate to the United States. Kemal seemed to be a prime candidate for the special visa. Yet he has applied three times, so far without success. Frustrated and outraged, Ham reached out to his elected representatives for help, first contacting Howard P. “Buck” McKeon, who represented California’s 25th congressional district. McKeon made inquiries of our Kabul embassy every month, but he was always told that it was simply a matter of “administrative processing” and that there was nothing to be done. When McKeon retired earlier this year, Ham contacted his successor, Representative Steve Knight. For a while, Ham’s calls seemed to get lost in the shuffle of the new Congress. But something finally caught Knight’s attention: a video of Kemal seated with his three children — whose faces were blurred for their protection — making the case himself. Kemal made it clear that this was a matter of life and death. Just days after sending that video to Knight’s office, Ham received a call. Knight resumed the inquiries with the Kabul embassy. They have yet to bear fruit, but in Knight’s rapid response, Ham finds further evidence of the power of film. 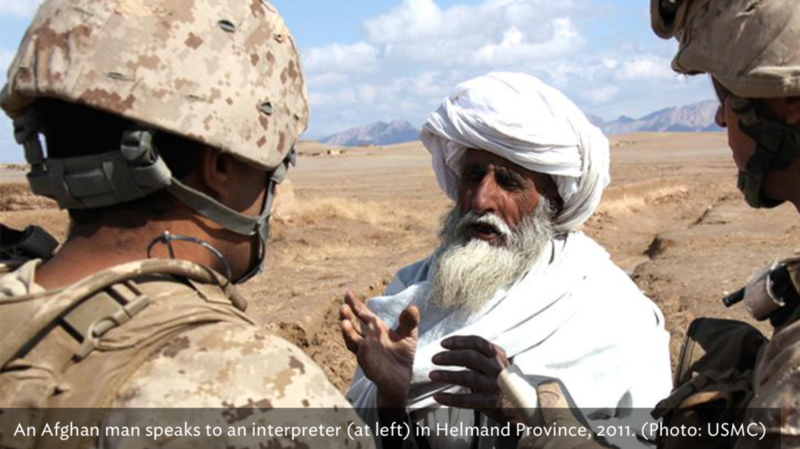 No one is sure how many interpreters have already been killed by the Taliban. Anderson cites an alarming figure from a 2009 report by the U.N. High Commissioner for Refugees: One interpreter is killed every 36 hours. If that is the true rate of slaughter, then some 1,460 interpreters would have been killed between 2009 and 2015. Western media outlets regularly relay stories of the Taliban making good on their threats. The Washington Free Beacon recently reported that an interpreter named Sakhidad Afghan was kidnapped, tortured, and murdered by the Taliban before his visa came. Similar stories have been related in the New York Times, the Daily Mail, and elsewhere. Ham said he was moved by the documentary, and he wanted to write a story that would move others in the same way. He had joined the Army Reserve after returning to the States, and now he became an MFA candidate in TV and film production at the University of Southern California. He wrote up a brief proposal and presented it to writer/producer Jenna Cavelle, who is head of research and development at USC’s Media Institute for Social Change. To his delight, she was enthusiastic. Cavelle agreed to write the screenplay and acted quickly to bring others on board. The production team now includes Michael Taylor, the producer of Phenomenon and other films, and Afghan-American actor Fahim Fazli, who played a minor role as an agitated elder in American Sniper and a much larger role in the soon-to-be-released Rock the Kasbah with Bill Murray. Ham was thrilled to find such support. “It helped me move away from that daunting sense that ‘I’m alone in this’ and get other people involved,” he said. In the coming days, the film team will work out the nuts and bolts of their partnership with No One Left Behind, an activist group that not only agitates to speed up the visa process for Afghan and Iraqi interpreters, but also helps them get jobs once they arrive Stateside. If the film ends up generating significant amounts of money, some of it is likely to go to No One Left Behind. For now, Ham is focused on getting to the $20,000 mark by the end of the month so that the team can proceed with production. Given the amount of bipartisan agreement on the matter, he is confident that enough donors will come forward once they understand what is at stake.